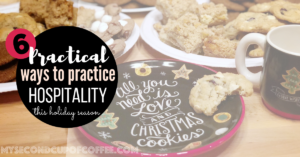 The holidays are here, and it is truly one of the best times to try to practice hospitality in your home. First of all, during this festive time, there are so many reasons and excuses to get together! Friendsgiving, baking Christmas cookies, watching holiday movies, Ugly Sweater parties, Winter Solstice celebrations, decorating the house, trimming the tree, New Year’s Eve parties are just a few to mention. Take advantage this holiday season and surprise someone with an invite to a simple cup of coffee or hot chocolate and enjoy the fellowship! It will bring joy, warmth, encouragements, connection, and countless other benefits of practicing hospitality to you and your guests. My First Year of Blogging: 5 Big Lessons - My Second Cup of Coffee on What’s in the name?